A small moth that lives at the edge of what is possible, as a caterpillar it lives a stop-go life taking around seven years to build up enough resources to finally pupate into the adult moth. Breeding Season: A two week period in the warm (er) days of late spring and early summer when the non-feeding adults emerge, mate, lay their eggs and die. Feeding & diet: A whole range of plant foods, with such short activity periods, they can't waste time walking around looking for that "just right" plant. They usually start off by eating the nearest plant when they hatch from the egg, they have a preference for young more nutritious and easy to chew leaves before they start to develop tannins. The adults don't feed at all in common with many moth species. Distribution: Northern Canada on the mainland and northern islands, also found on Greenland. Predators: Around 75% of all caterpillars are killed by 2 species of parasitoid wasps and a species of fly. What are Arctic Wooly Bear Moths like? how do they survive? The Arctic Woolly Bear Moth is fairly non-descript looking small drab moth. It lives its whole life in the far north of the Arctic on the mainland and northern islands of Canada and around the vegetated coastal strip of Greenland. It is notable for living a stop-go life whereby the caterpillar takes around seven years to build up enough resources to finally pupate into the adult moth. It was previously thought to take fourteen years to do this, though revised estimates now make seven a typical though not absolute length of time reference. This aspect of the lifestyle alone is not actually so unusual, there are other insects that spend several years as a larva and just a few weeks or months as an adult. Dragonflies can spend up to five years as an aquatic larva before emerging while some cicada species can go for thirteen or seventeen years at the larval stage. There are also many other polar invertebrates that have a stop-go lifestyle dependent on the temperature. Arctic woolly bear caterpillars spend most of their lives actually frozen just thawing out for a short time in the summer. Only the caterpillar is resistant to freezing, they pupate in their final summer in just two weeks and then the adult moth dies after a short summer of finding a mate and laying eggs. The eggs then hatch quickly so that the cold resistant caterpillars can overwinter. 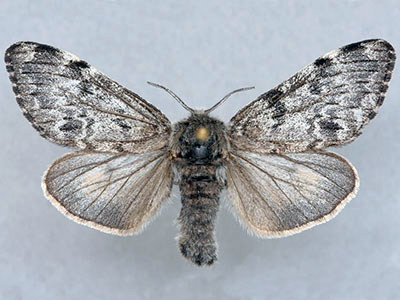 Like many other adult flying insects, the adult moths don't feed at all. Over its lifetime, they will freeze and thaw seven times (typically). 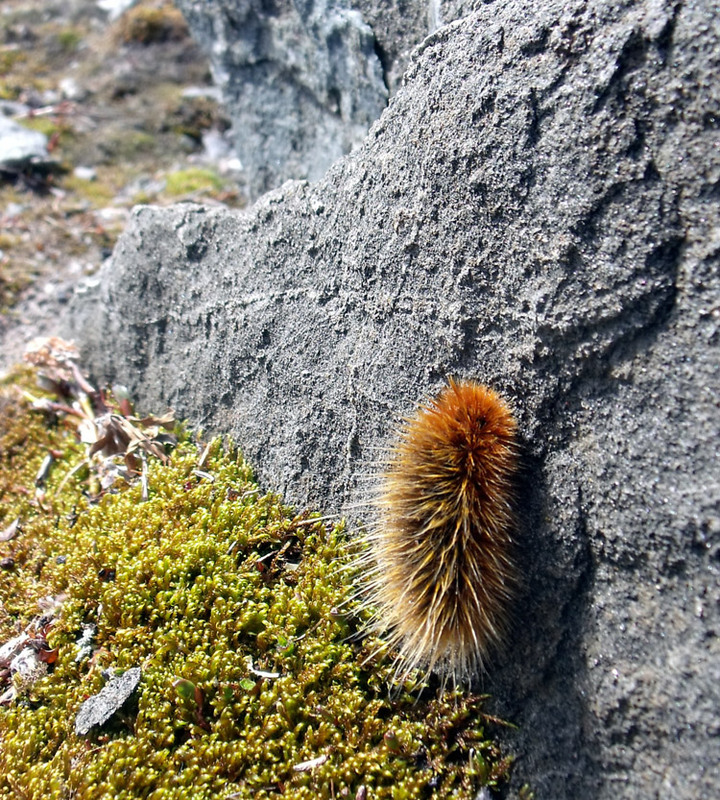 Arctic wooly bear moth caterpillar, basking in the sun on a rock. Rocks warm up more quickly and effectively than surrounding soil or vegetation so they make a much better place to warm up to become active. In such conditions the caterpillar can reach a temperature of 20°C above ambient, especially if there is snow or ice nearby to reflect more sunlight. Basking to warm up (behavioural) - The caterpillars spend up to 60% of their time while active basking in the sunlight to reach a temperature where they can feed and grow. This happens mainly around midday when the caterpillars can reach a temperature of up to 30°C, around 20°C above the surrounding air temperature in ideal conditions. They usually also bask after feeding before feeding again or moving onto a new site. reference They spend around 5% of their lives actually feeding almost entirely during the month of June. A covering of hairs or setae that conserve heat (anatomical) - The source of the Woolly Bear caterpillars name is also one of its adaptations to living in a harsh environment. Once warmed up by basking, the hairs help to retain the heat so allowing the caterpillar to remain active for longer and also to allow its metabolic processes such as digestion to take place more efficiently. The production of cryoprotectants in the blood and body tissues (physiological) - This is a vital part of the cold adaptations that allow this cold blooded creature to survive even though it may be frozen solid down to -70°C. There are a number of different chemicals that the caterpillar produces to this end such as glycerol and others that are more exotic. An aspect of the production of these chemicals is that it results from the breakdown of the mitochondria in the cells, these are then re-synthesized again the following year when the caterpillars become active again.